Since its inception, Girl Scouts has been an organization for girls of all ages, races, religious beliefs, and abilities. Every girl who wanted to join could, and for the last 106 years, has! Girl Scouts' founder, Juliette Gordon Low, was herself deaf from an early age, and a fierce advocate for the inclusion of girls with disabilities or special needs. Where once children with special needs were sent away, or hidden in the home, today we see more and more families living active, public lifestyles, including their children with special needs. And that means we’re also seeing more and more girls with various special needs joining Girl Scouts, which is fantastic! But not all Girl Scout volunteers have experience working with children of different abilities, which sometimes results in Girl Scouts with special needs being unable to participate in all of their troops' activities or programs, due to unintentionally exclusive practices. You can't know what you don't know, of course! But giving every girl a chance to be a Girl Scout is so important - not only for those girls with special needs who want to participate, but for every girl in the troop to grow alongside a group of Girl Scout sisters who can share all kinds of different perspectives and life experiences. As the mom of a Girl Scout with special needs, and the author of an award-winning children's book on inclusivity, here are some things I recommend that all volunteers consider when creating programs and activities, to ensure inclusivity across the board. Would you be able to fully participate in this activity/program if you had mobility issues? What about if you had sensory issues, or a seizure disorder? If the answer is "no," you may need to either rethink the program or activity, or think of alternatives or adaptations that would still allow girls that need accommodations to participate and have a great time. No one expects you to be an expert in inclusion, accessibility, or adaptations. But often times, the parents are. If you have a girl in your troop with special needs (visible or invisible) feel free to let the parents know that you want to make sure their child is getting the most out of her Girl Scout experience. Let them know that you would really appreciate any guidance or input from them in regards to what works best for their child. It’s not considered rude, and I’m willing to bet they’ll appreciate your commitment to an excellent experience for ALL the girls in your troop. You may need to be more hands-on when facilitating some activities, to help the other girls understand how they can all work together, taking everyone’s needs into account. Remember that YOU set the tone for how your girls will interact with each other, special needs or not. No really. I know it seems funny to say “read my book” to understand the concept of inclusion and special needs, but I’ve had countless families tell me that it not only helped them understand inclusion, but also started a kid-friendly conversation around special needs, inclusion, and being a friend. So if you know you have a girl with some special needs joining your troop, maybe give it a quick read! I hope you find this information helpful in building inclusive troops. And for those of you who want to give your girls the opportunity to discover inclusivity for themselves, be sure to register them for the Girl Scouts for ALL patch program coming up on April 14th! I can't wait to meet you and your Girl Scouts. A Girl Scout's Guide to National Girl Scout Week! It's that special time of year when Girl Scouts of all ages celebrate and show the world what it means to be a G.I.R.L. (Go-Getter, Innovator, Risk-taker, and Leader). March 11th - 18th is National Girl Scout Week! Girl Scout Week always includes March 12th, to commemorate the day Juliette Gordon Low officially registered the first 18 girl members in Savannah, Georgia. And since one day just isn’t enough time to honor such a momentous occasion, we’ve dedicated a whole week to celebrating the greatness of Girl Scouts! Girl Scout Week begins on Girl Scout Sunday and ends on Girl Scout Sabbath--two opportunities to reflect on what it means to be a Girl Scout within the context of your faith. Wear your Girl Scout uniform and take part in a service at your place of worship. Learn about a faith tradition that you are not familiar with. If your troop meets at a place of worship, you may consider performing a service, such as a greeting, ushering, or doing a flag ceremony. Volunteer to assist with teaching or watching the younger children in your place of worship. Volunteer to lead a prayer or song in your place of worship. Here are some ideas! Find a quiet, peaceful place to think about all of the things you are grateful for. Host a Girl Scout birthday party – guests could bring toys to be donated to a homeless shelter, money to be sent to the Juliette Gordon Low Fund, or donations for your favorite charity. Think about what Girl Scouts means to you and write a letter rededicating yourself to Girl Scouts. Memorize the Girl Scout Promise and Law and recite it to your family. Invite a friend to attend your next Girl Scout meeting and join the Sisterhood. Wear your uniform and/or membership pin proudly today! Be a Go-Getter! Here’s your chance to show the world what it means to dream big and achieve your goals #likeaGirlScout. Get together with your troop and brainstorm some projects, badges, or activities for a Girl Scout Bucket List. Then pick one to start with! Pick a new Journey to go on with your troop, and learn about the difference between completing a service project or a Take Action project at the Journey’s end. Get involved civically. Connect with your local officials; learn about Girl Scouts’ legislative agenda; or work towards earning your Gold Action Award. Take a peek at the Girl Scouts’ Gold Award Weekly Highlights, and inspire yourself to dream big. Which Highest Award in Girl Scouting are you ready to earn: Bronze, Silver, or Gold? Research the requirements for your level, and brainstorm project ideas today! If you are a Cadette or older, sign up for a Highest Award Training to learn more and get started working toward these highest achievements that a Girl Scout can earn. Time to be an Innovator! Think outside of the box, explore unfamiliar territory, and experiment. You might especially want to dive into STEM today--that’s Science, Technology, Engineering, and Math, four fields where girls and women are breaking barriers and innovating every day. Girl Scout innovation badges encourage problem solving using scientific methods from fields like anthropology, engineering, graphic design, and business. Check out your Girl’s Guide to Girl Scouting and pick out a badge activity to do today. Did you know that Girl Scouts of Southern Arizona was chosen as one of FIVE councils nationwide to pilot a new older girl STEM Journey? If you are a Cadette, Senior, or Ambassador, you're invited to participate! Learn how to code—no previous STEM experience necessary—and be a part of Girl Scout history by helping improve STEM programs for future Girl Scouts. Sometimes the real challenge of being an innovator is limiting your resources, or discovering new ways to them. Use your resources wisely today by tackling a recycling or upcycling project; or if you live in Tucson, sign up for a badge class at Upcycle Tucson to explore more. Perhaps you would rather create a project through Made With Code; make different paper airplanes and see which design flies best; or explore the history of female inventors? Go for it! The sky’s the limit on Innovator Tuesday! Get outside today! Play games, go geocaching, go on a hike, or have another outdoor adventure for at least 30 minutes. Explore Girl Scout Destinations – the ultimate adventure for girls ages 11 and older. With different trips every year, there’s something amazing for everyone. Check out all the awesome 2018 summer camp programs, pick your favorite, and make a list of what you might need to pack! Create a nature scavenger hunt; or make a collage of things only found in nature. You don’t have to go outdoors or travel far to practice healthy risk-taking! Take a break from your everyday activities and try something new within Girl Scouting. Check out our Programs Calendar and sign up for an event that challenges and excites you. With your troop, spend the day serving your community – volunteer at your local food bank, animal shelter, senior homes, schools, or wherever you feel your time would be best spent. Explore the G.I.R.L Agenda materials for your Girl Scout level, and make a plan to make your voice heard within your community, the country, or the world. Join the Girl Volunteer Corps! Our volunteer club for girls in 6th-12th grades makes the world a better place through a variety of service projects, which you get to decide on with your Girl Scout sisters. Making your community a better place has never been so fun! Want more of a challenge? Turn your day of service into a friendly competition! Together with your troop, commit “Random Acts of Kindness” today – anything from holding a door open for a stranger to setting the kitchen table for your family to making someone smile! 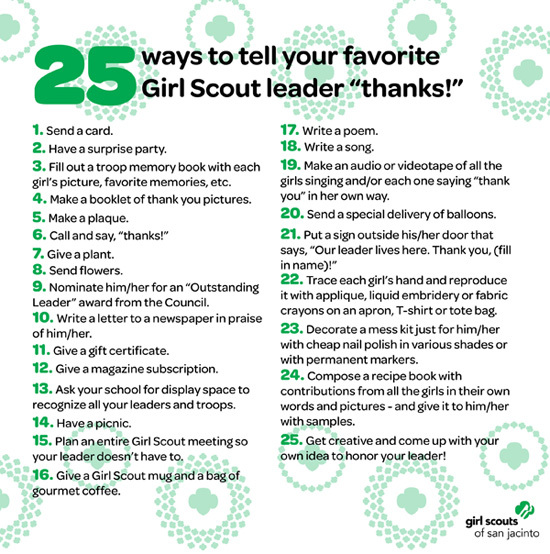 – and keep track of how you and your Girl Scout sisters are leading the way. As a Girl Scout Volunteer you’re not only a role model who gets to show her something new, but you also get to share all those memorable moments together. You make a difference at Girl Scouts and your impact is so special! Today is a day to celebrate you. Leaders, co-leaders, and volunteers, give yourself a pat on the back! We appreciate the work you do, and are so thankful you make Girl Scouting meaningful. Girl Scouts, you might want to plan an appreciation for your troop leaders to take place during National Volunteer Week (April 15-22)! Or here are 25 ways you can say thank you today. Want to show a fellow volunteer some love? Don’t forget to nominate the volunteers that make a difference in our Adult Awards.